This isn’t exactly a standard type of post for this blog, but then perhaps I shouldn’t be too strict with myself as far as things I write about. After all, it’s my personal blog. I make (and break) the rules. And anyway, nobody reads it. If you are reading this, consider yourself one of a very select few. 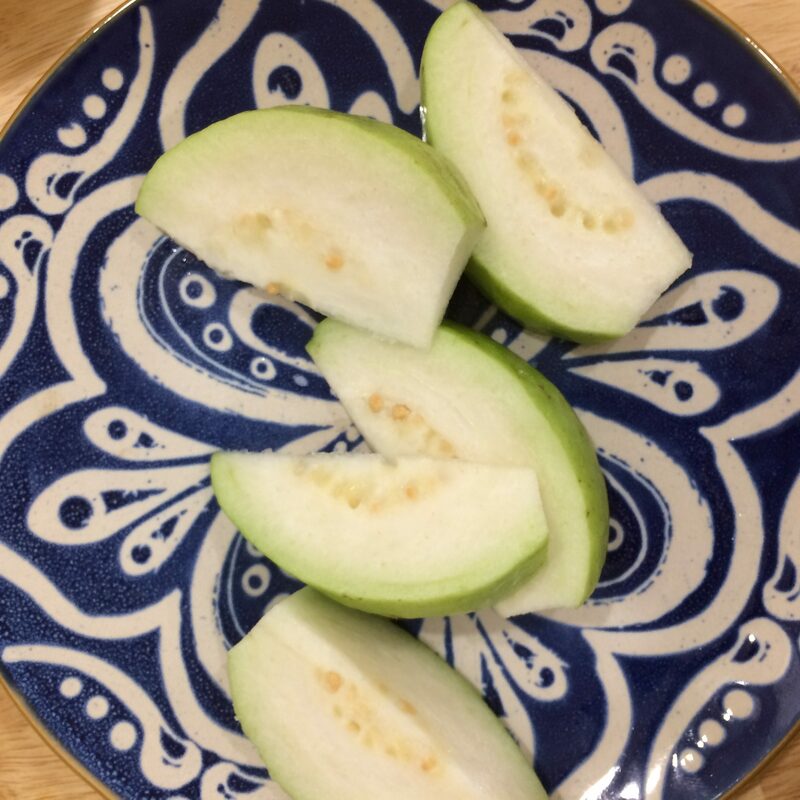 I’m no health specialist, and this is just a sample of one, and much less scientific than my A/B testing for coffee (which wasn’t scientific at all), but I’m totally crazy about Guava, and what I perceive to be its health benefits for me. Growing up in Israel, guavas were kinda pungent, slightly mushy, yellowish fruit. It was also one of those things the local Israeli folklore qualified as “either you love it or you hate it” (we have no Marmite in Israel, not to my knowledge anyway. Or maybe there’s a strong consensus and everyone hates it? anyway, I digress). I guess I was in the “love it” camp, but I don’t recall being particularly crazy about it either. I think the local wisdom was also that it causes constipation, so I guess I tried not to have too much of it. I no longer live in Israel. But I also don’t come across Guavas. At all. I lived in London for a number of years, and I don’t recall eating any there, or even seeing them. Maybe pink, artificial guava juice. And I now live in Berlin for several years, and I can’t think of seeing any here either. How come?? I do see them everywhere in Thailand and Vietnam though. It’s literally around every street corner. Every fruit stand would typically have them besides Papayas, Pineapples and Watermelon. You can also have a proper, fresh, guava juice or shake in lots of places. The Thai and Vietnamese typical variety is bigger, green, and white on the inside (although you can find the pink type if you look for it). I’ve never seen the yellow-ish type here. It’s also eaten much less ripe. It’s crunchy. It’s not sweet, but there’s definitely a good hint of sweetness to it. And I love the flavour. So when I’m visiting SE Asia, I typically find myself eating one Guava a day. And — this is the non-scientific part — I think it does wonders to my digestion. Without being too graphic, everything just flows perfectly. No constipation. No diarrhea. I rarely feel that my digestion is in such perfect balance at home in Berlin. Now, I eat very differently when I’m in SE Asia, so it can be a multitude of reasons. Less dairy, less bread, more spicy food. Much more street food. But my gut feeling (no pun intended) is that it’s mostly the guava that does the magic. And I don’t think it’s some placebo effect either. 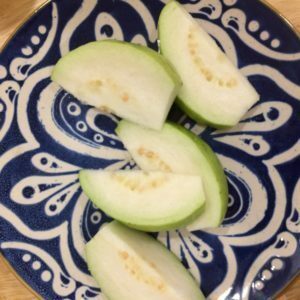 I didn’t read about Guava and then decided to try it and now feel that “it works”. I just started eating it because I liked it, and then realized that it makes me feel great. I only recently started reading about it online, and it’s getting a lot of praise. Apparently it’s the only fruit recommended for diabetics. It’s rich in fiber and vitamin C (apparently a Guava would have 4 times as much vitamin C as an orange!). And it’s one of those magic fruits that’s good for both constipation and diarrhea (is it possible?). Ok, it’s one of those things like Turmeric, Garlic or Chia seeds I suppose… You’ll get lots of websites writing about the amazing benefits of it, and maybe including some affiliate links for discounted supplements :). But I don’t have any aspiration to become a health guru, nor to jump on any affiliate scheme. And this isn’t a scientific blog, so I’ll leave it at that. One amazing tip I can share however, is where to find them in Germany. Asian and African MasImpex Supermarket – 6.80 EUR per Kilo + 5 EUR delivery (2-3 days). VeganSnacks – 10 EUR per Kilo (looks like minimum of 2 kilos), with delivery charge of 6.90 (also 2-3 days). I have never tried Guava but after reading the post I found a place where I can buy it and I’m now very curious to taste it. Hope you like Guava. I can’t imagine tasting it for the first time. It’s not a “wow, so delicious” kind of fruit. It has more of a subtle taste. But I love it.